Willard Marine’s SEA FORCE®1100 is designed and built for the most discerning mariners in the world: the United States Navy. For 15 years, we have collaborated with the Navy for today’s most rugged and reliable 11-meter rigid hull inflatable boat (RIB) that can accommodate up to 26 crew members. It is designed with a deep-v hull for maximum stability, center console and non-skid deck. The U.S. Navy and many allied foreign military agencies rely upon these durable RIBs for patrol, rescue, and Visit, Board, Search and Seizure (VBSS) operations performed around the world. It is currently built with Cummins QSB 6.7-liter 380-hp twin engines paired with Hamilton Jet HJ292 water jets, but similar version is available with twin Cummins QSB6.7 480-hp engines and Hamilton Jet HJ292 water jets. Each vessel has aft seating plus removable seating for additional people on the foredeck and a multi-chamber, 40-ounce polyurethane tube that is exceptionally strong, puncture resistant, UV-coated and provides buoyancy and reduced vessel weight for maximum performance, fuel economy and safety at sea. Willard Marine’s SEA FORCE®900 is a military-grade rigid inflatable boat (RIB) with a deep-v hull for maximum stability and non-skid deck. The forward open deck provides an unobstructed work area with an 18-person capacity, and serves well as a patrol, tug, tow, or work boat. Willard Marine’s SEA FORCE® 730 is a proven, military-grade rigid inflatable boat (RIB) designed with a deep-v hull for maximum stability and non-skid deck for a 10-person crew. Known for its exceptional durability, the 730 is also fast and responsive, which is ideal for patrol, rescue, and commercial applications. Its multi-chamber, 40-ounce polyurethane tube is exceptionally strong, puncture resistant, UV-coated and provides buoyancy and reduced vessel weight for maximum performance, fuel economy and safety at sea. Willard Marine’s SEA FORCE® 700 is designed and built for the most discerning mariners in the world: the United States Navy. 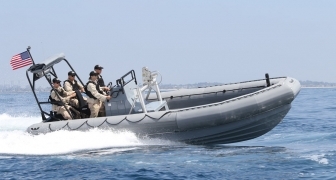 For 25 years, we have collaborated with the Navy for today’s most rugged and reliable 7-meter rigid hull inflatable boat (RIB) that can accommodate up to 18 crew members. It is designed with a deep-v hull for maximum stability, a non-skid deck, center console, and is compatible with a variety of existing shipboard handling and stowage systems, including traditional davits and stowage chocks and other class-specific launch, recovery, and handling systems. It is currently powered by a 258-hp inboard Steyr diesel engine with a Bravo Two X MerCruiser sterndrive and includes a Briartek man overboard indicator system display and antenna. Its multi-chamber, 40-ounce polyurethane tube is exceptionally strong, puncture resistant, UV-coated and provides buoyancy and reduced vessel weight for maximum performance, fuel economy and safety at sea. Willard Marine’s SEA FORCE® 670 is a proven, military-grade rigid inflatable boat (RIB) designed with a deep-v hull for maximum stability and non-skid deck for a 9-person crew. Outfitted with either an inboard or outboard engine, the 670 makes an agile and extremely rugged patrol boat, work boat or tender. Its multi-chamber, 40-ounce polyurethane tube is exceptionally strong, puncture resistant, UV-coated and provides buoyancy and reduced vessel weight for maximum performance, fuel economy and safety at sea. Willard Marine’s SEA FORCE® 540 is a proven, military-grade rigid inflatable boat (RIB) designed with a deep-v hull for maximum stability and non-skid deck for a 6-person crew. Outfitted with and outboard engine, the 540 makes an agile and extremely rugged patrol boat, work boat or tender. Its multi-chamber, 40-ounce polyurethane tube is exceptionally strong, puncture resistant, UV-coated and provides buoyancy and reduced vessel weight for maximum performance, fuel economy and safety at sea. Willard Marine is proud to be the only American manufacturer of SOLAS rescue boats. Our 670 SOLAS is designed and built to meet all United States Coast Guard standards required for this type of Safety Of Life At Sea vessel, featuring a fiberglass, deep-v hull for maximum stability and a non-skid deck. The multi-chamber, 40-ounce polyurethane tube is exceptionally strong, puncture resistant, UV-coated and provides buoyancy and reduced vessel weight for maximum performance, fuel economy and safety at sea. The 670 is also outfitted with a self-righting system and three-point lifting sling. When you need the safest rescue boat available, please contact us for more information about our SOLAS products and other Willard Marine vessels. Willard Marine is proud to be the only American manufacturer of SOLAS rescue boats. Our 490 SOLAS is designed and built to meet all United States Coast Guard standards required for this type of Safety Of Life At Sea vessel, featuring a fiberglass, deep-v hull for maximum stability and non-skid deck. The multi-chamber, 40-ounce polyurethane tube is exceptionally strong, puncture resistant, UV-coated and provides buoyancy and reduced vessel weight for maximum performance, fuel economy and safety at sea. Both our tiller and side console models are outfitted with a self-righting system and three-point lifting sling. The large and versatile 55’ Willard Marine Patrol Boat can be utilized for search and rescue, fire fighting, piloting, coastal missions and commercial purposes. Using a proven fiberglass or aluminum hull originally engineered for the United States Navy, Willard Marine has improved the creature comforts to provide your crew with a smooth and safe ride with full-range viewing capabilities and a spacious cabin with berths for 8 people. A hydraulic bow thruster enables impressive maneuvering capabilities in narrow waters. Willard Marine’s 40’ Open Ocean Fast Response cabin vessel is capable of handling emergency responses in all weather conditions, including search and rescue, air-sea disasters, medical support and transportation. Built with a fiberglass or aluminum hull and deck, the collar is a combination of air and foam polyurethane to provide durability and stability. It features a berthing, kitchenette, and head and shower areas. Built to U.S. Navy Standards, this is the cabin version of our 11m Standard Navy RIB. Powered by twin inboard diesel engines and water jets, this RIB comes equipped with air conditioning, heating, interior ventilation fans, and weathertight sliding port and starboard screen windows. While very fast, this boat is comfortable for crew, offering protection during long patrols. Willard's 22-foot Riverine is designed for many functions from a heavy-duty work boat to an armed patrol boat. This fast, agile craft can be air lifted into an area of operation or be trailered over road to the required destination. With a large capacity fuel tank, full complement of electronics and high speed capability, this boat is well-equipped to perform demanding military and commercial tasks in shallow and littoral waters. The MISSION PROTM 730 is designed with input from some of the largest patrol units in the country and includes a weather-protected laptop storage compartment, ergonomic console and seat design, plenty of dry storage, and an aft-folding windscreen that’s safe and convenient for one-person crews. Our inflatable collar and reinforced rub-rails reduce risk of boat damage upon boarding and provide stability during personnel and equipment weight shifts. Crash rails for engine protection, tow-posts, gun lockers, communications gear, electronics packages, colored light lenses, and a variety of boat colors and graphics are just the beginning of customizable features that Willard offers. Proudly built to USCG and ABYC specification standards, combined with the stringent quality controls required through our ISO-certification, MISSION PROTM patrol boats will successfully endure years of heavy usage, saving patrol units significant time and money. Please contact us for more info about Willard Marine Patrol Boats. Willard Marine, Inc., is proud to be the only American designer and manufacturer of Safety of Life At Sea (SOLAS) rescue boats, which are built under ABS inspection, rigorously tested and certified by the United States Coast Guard. Emergency services, rescue agencies, commercial shipping companies and other organizations appreciate the speed, stability and maneuverability of Willard Marine SOLAS boats in the most challenging rescue operations. Willard Marine, Inc., has acquired the rights to design and manufacture Surf Pro boats, a line of surf and rescue vessels that have been an icon on the West Coast for nearly six decades. Surf Pros are still being used by law enforcement and lifeguard divisions in the California coastal cities of Long Beach, Huntington Beach, Newport Beach and Oceanside to name a few. Now in development is a 33-foot Surf Pro Patrol Boat designed by Willard Marine with an updated, all-fiberglass hull and deck, plus modern equipment and outfit items for today's advanced patrol officers and first responders. The SEA FORCE® 777 is a mission-proven, fiberglass, rigid hull inflatable boat (RHIB) modeled after the standard ship-board vessel we have built for the U.S. Navy for 25 years. Designed with a deep-V hull for maximum stability in the roughest sea conditions, it achieves 300 hp with a SE306J38 diesel engine with ZF-63 marine gear powering a Hamilton Jet drive HJ-274. Ullman Dynamics shock-mitigating seats have been installed for crew comfort and safety, and the 40-ounce polyurethane inflatable collar is UV coated and features rub-strakes to reduce risk of boat damage upon boarding and stability during weight shifts. Shown above with optional self-righting and lifting frames, the SEA FORCE® 777 is rugged, reliable and ready for the toughest blue-water missions. Willard Marine is proud to be the only American manufacturer of SOLAS rescue boats. Our 590 SOLAS is designed and built to meet all United States Coast Guard standards required for this type of Safety Of Life At Sea vessel, featuring a fiberglass, deep-v hull for maximum stability and a non-skid deck. The multi-chamber, 40-ounce polyurethane tube is exceptionally strong, puncture resistant, UV-coated and provides buoyancy and reduced vessel weight for maximum performance, fuel economy and safety at sea. The 590 is also outfitted with a self-righting system and three-point lifting sling. When you need the safest rescue boat available, please contact us for more information about our SOLAS products and other Willard Marine vessels.